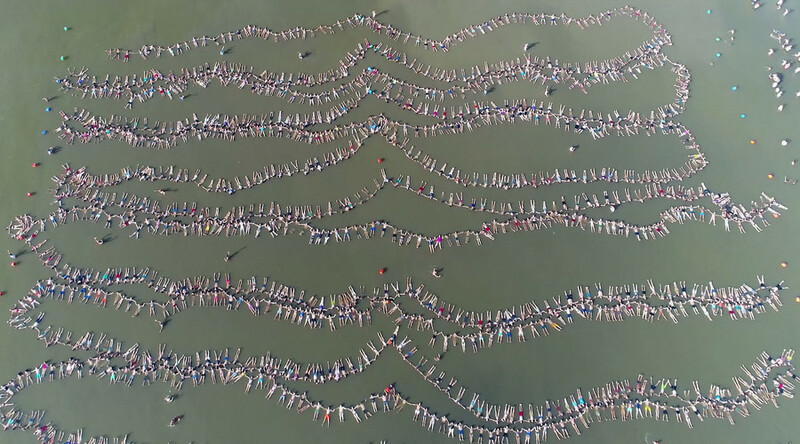 A group of almost 2,000 people in Argentina has set a new Guinness world record for the most amount of people floating in a continuous line - inadvertently creating the world’s best drone shot at the same time. The crowd joined together in the salty lake Laguna de Epecuen near Buenos Aires on Sunday, to steal the title of ‘most people floating while connected’ from China, who set the record with 650 people back in 2014. A Guinness Book of Records representative was on hand to certify that 1,941 people free-floated in a connected line simultaneously for 30 seconds. Locals and tourists participating in the feat ranged from the minimum age Guinness allows to participate in record-setting attempts, 10 years, to over 80. People traveled from all over Buenos Aires to participate in the challenge, which was filmed by drone for verifying purposes - and our of course, our viewing pleasure.